Gardens are almost always green. But even green gets boring. 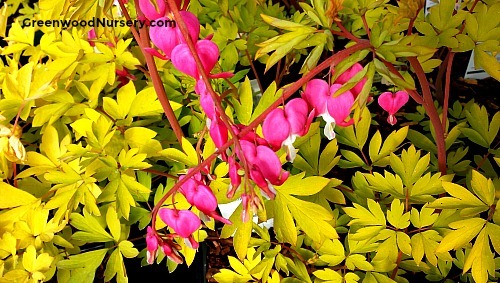 This is why you need the Dicentra gold heart, to bring the spark of golden color into your flower garden. Unlike most garden flower plants, the golden dicentra has golden colored leaves that are shaped like old fashioned bleeding hearts. When it blooms in late winter, it does so in a vivid display of white and pink flowers that are also shaped like the leaves. The flowers dangle from long wands suspended over the foliage. It’s a heart galore all over for this flower. On average, the Dicentra spectabilis grow to medium size. It spreads to twenty-four inches in maximum height and thirty-six inches in width. This is why you need each plant to have some spacing from each other, thirty-six inches of spacing between plants always works just fine. The plant also needs full to partial shade, and constant watering to maintain its foliage. The leaves shrink pretty fast when exposed to the full glare of the sun. To grow best, you should plant them on slopes facing away from direct sunlight. It is important to take note that all this growing works best in slightly any type of soil, as long as the soil is well drained. Maintenance for this plant is easy. Apart from its constant watering needs, it needs areas with good drainage, especially during its early stages. Do not plant it in clay soils, not unless you don't want to it to grow. It also needs protection from high winds, and lots of manure on its root areas to stimulate its growth. The dicentra gold heart has multiple uses. You can use it as a garden boundary, for firescaping, or simply plant it in woodland gardens where it blooms well. The brighter colors of its foliage can be used to form interesting contrast patterns in your garden.